Easy design and better user experience. Came across a soundtrack on YouTube you really liked and want a quick and convenient way to transfer it to your MP3 player? 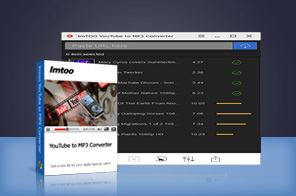 ImTOO YouTube to MP3 Converter is just the FREE software you need. This FREE YouTube MP3 Downloader software can download and convert YouTube videos FLV, MP4, and Webm to audio MP3, even convert YouTube HD videos to MP3 to compatible with your MP3 player in one quick and easy step. Download ImTOO YouTube to MP3 Converter for FREE now and enjoy YouTube soundtracks whenever and wherever you fancy. Download and extract soundtracks from videos on YouTube and convert them to MP3 format. Just one step to download and convert YouTube to MP3. Download and convert YouTube HD videos to MP3 easily..
Set custom download and conversion settings..
Multi-language interfaces: English, German, French, Japanese, Simplified Chinese and Traditional Chinese. Tutorial : Guide for ImTOO YouTube to MP3 Converter - How to download and convert YouTube to MP3? Download and convert YouTube videos to iTunes, all iTunes formats, i.e., MPEG-4, H.264 and MP3 supported. How to download music videos from YouTube free?